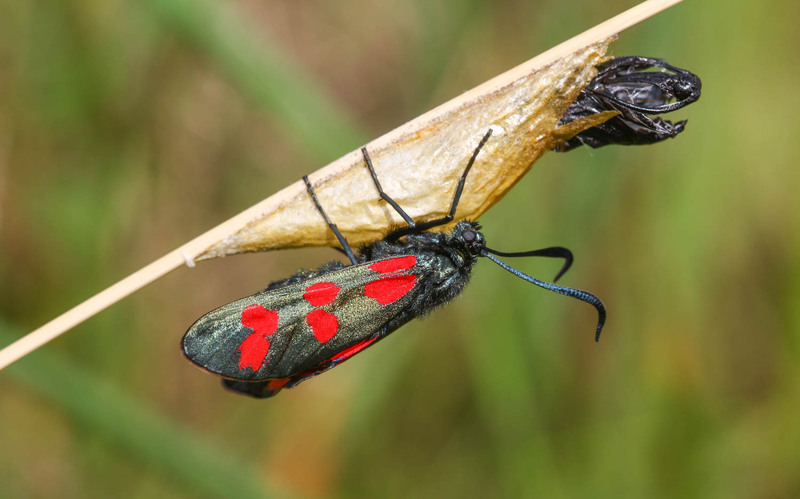 The Six-spot Burnet moth (Zygaena filipendulae) is a classic summertime day-flyer, frequently encountered in grassy landscapes and open scrub habitats. 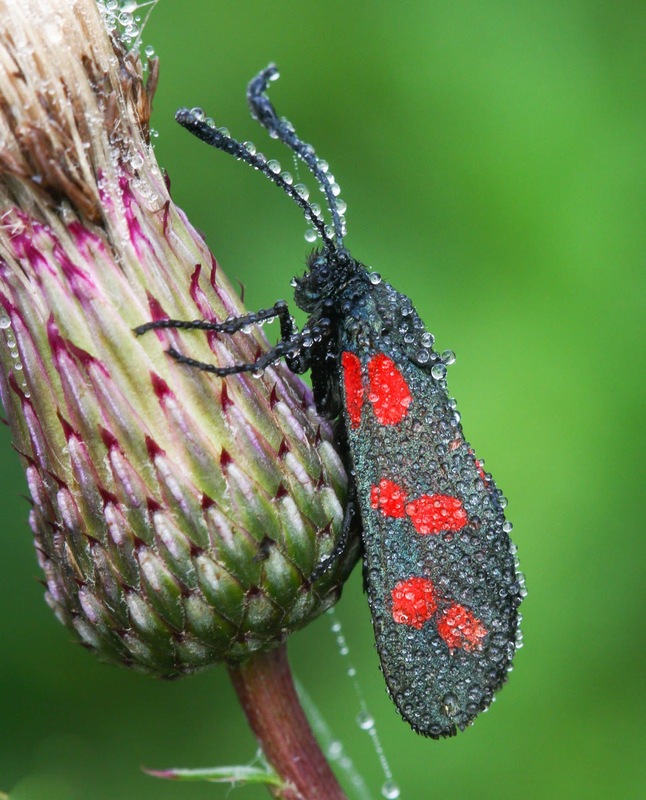 They are amongst several similar-looking species in the burnet and forester family, although are the only member to exhibit six red dots on each forewing. That said, some individuals may have fused spots to confuse matters, and some forms can have yellow spots (a subspecies called Z. f. flava), with brown spots noted in a few rare cases! The life cycle of this moth involves Bird's Foot Trefoil as the primary foodplant. The eggs are laid on this low-growing species, where the caterpillars hatch out and spend at least one winter (sometimes two) before they reach full size; they grow in a series of moults called 'instar' stages, where the outer cuticle (the exoskeleton) is shed to allow room for expansion before the next cuticle hardens. 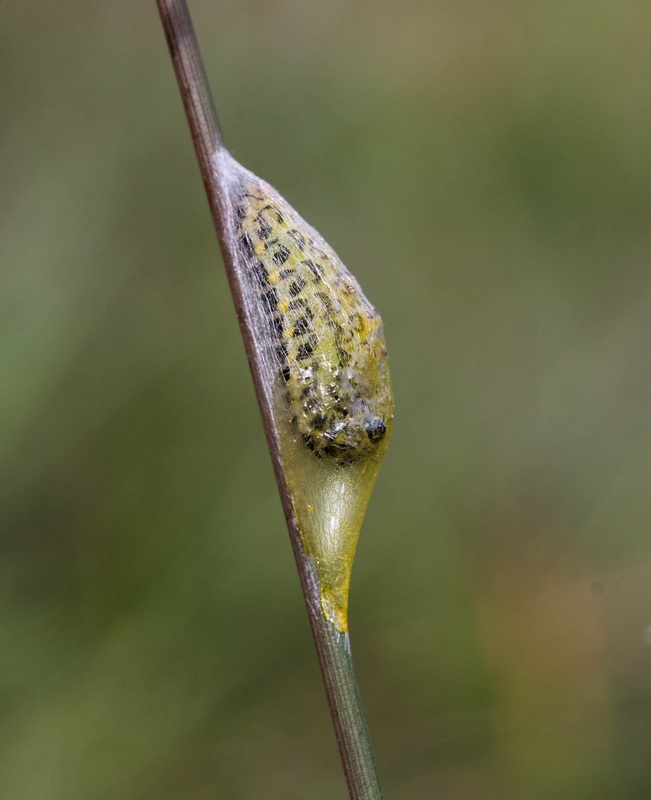 After the last instar moult, the caterpillar will find a stout blade of grass or fence post on which to pupate, spinning a silken encasement in which it undergoes its radical transformation. After a week or two, the adult moth bursts out of this silken tube, pumping hemolymph and other fluids into their delicate, crumpled wings. 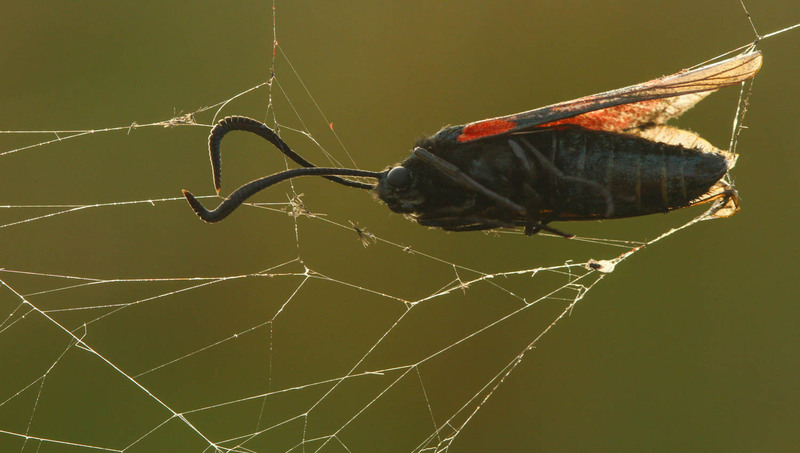 The striking black-and-red patterning of the adult moth is an example of aposematic colouration, warning would-be predators that they really aren't that tasty to consume! 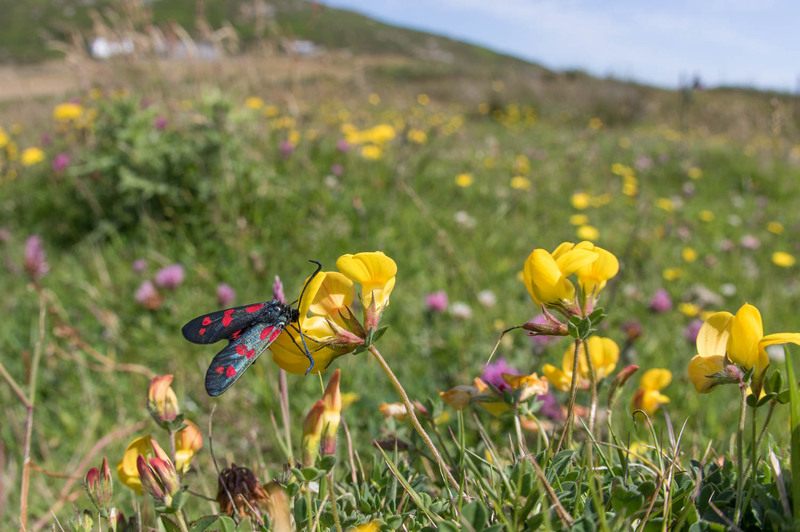 A Six-spot Burnet feeding on some Bird's Foot Trefoil with Bardsey Bird and Field Observatory in the background. A sunny summer's day! A late instar caterpillar half way through constructing its cacoon...the whole process took just an hour or so!